Awhile ago Suey of It's All About Books posted over at Weekly Geeks about One Title Collections. These are collections of a single book. I immediately grinned and ran through a mental list of the one title collections currently residing on my shelves. You see, I'm very guilty of this particular sin. When a new edition of a very beloved book comes out, I start to pine. Soon I'm haunting the book online and in my local stores. Eventually I break down and buy it and admire it daily next to its fellows on the shelf. This behavior perplexes DH to no end. Especially when it happens with an entire series. But what can I say? Part of it is a love for those characters and those words wrapped up in gorgeous new clothes. And part of it is that hunting gene some of us bibliophiles seem to have, which causes us to take an inordinate amount of pleasure in the actual process of finding and procuring books. A dangerous and heady combination, my friends. 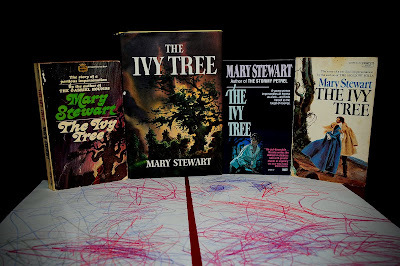 The Ivy Tree by Mary Stewart--just a classic. A missing heiress, the Northumberland countryside, and one of the best endings ever. 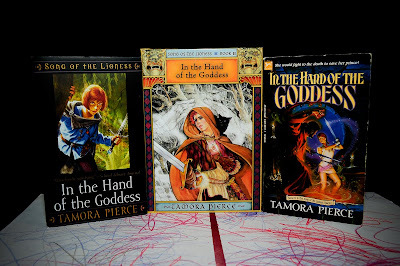 The Song of the Lioness by Tamora Pierce--Because, well, you already know why. 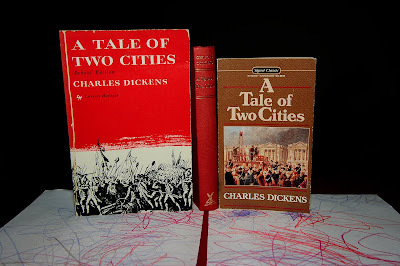 A Tale of Two Cities by Charles Dickens--when I see an old copy at a used book or library sale I have to buy it. It's like a tic. To add to the above collection of Ivy Trees because clearly four is not enough. These would bring my The Blue Sword and The Outlaws of Sherwood totals to three apiece. Because I only have one copy of this beautiful, beautiful book and this fact makes me nervous. Last of all--this little set. I own all five in two different, much older editions but they are each so wildly different (and so eminently lendable) and I just love everything about these recent reissues. What about you? Do you have any one title collections? Are there specific editions that are just calling out your name? On the flip side (and you will not hurt my feelings if you think I'm right out to lunch) do you find it hard to fathom owning multiple copies of a single book? I own three copies of The Windflower by Tom and Sharon Curtis (old school romance). I adore this book. And they're very, very expensive to buy online, since it's out of print. I have 4 copies of The Little Prince, but they are different language versions: French, Spanish, English and German. I have soooo many....Tale of Two Cities, but more as a result of combining all of my husband's copies with mine when we got married. Something like 5. Robert Louis Stevenson. I've got abotu 4 of his New Arabian Nights in various places. Little Women. Oh MAN. I have I believe SEVEN. But I kept finding old editions... I also h ave multiple copies of her other books. Austen's books have multiple copies, usually two, but frequently 3. The True Confessions of Charlotte Doyle...I have a signed first edition (made out to me, but found at a used book store), plus a couple other ragged paperbacks....and I dont' know if this counts, but I had to keep buying the Goose Girl because I kept giving it away as a favorite. So, theoretically I've bought 5 copies. lol, I don't keep doubles! Your post makes me feel like I should... 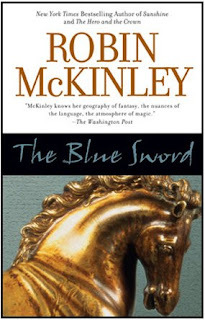 I do like all of Robin McKinley's different covers. Though what am I supposed to do with the doubles with such limited space? I wasn't a fan of either Charlotte or Emily, so maybe I'll pick up that book by Anne's and it'll all be better! I have a lot of copies of UGLIES, because I keep giving it away. Aside from that, it's mostly multiples on Jane Austen. I have like six Persuasions. I do this a lot, too -- when I really love a book I'm always on the lookout for the prettiest cover, which is why I have multiple copies of Nine Coaches Waiting and several Northanger Abbeys. Your post is making me salivate. I think that means I get it, even though I don't have any cool collections of my own to speak of. And now, I'm off to add The Ivy Tree to my TBR! Sheesh. I don't think I have more than one copy of any books. Not that I haven't thought about it often, but probably because I rarely buy books at all. I'm more of a library user. I didn't think that I was a one title collector, but I do have a few: Jane Eyre, Wuthering Heights, Pride and Prejudice. I think those are the ones I have at least three copies of. I don't usually buy duplicates anymore though. Too many books I don't own and want. 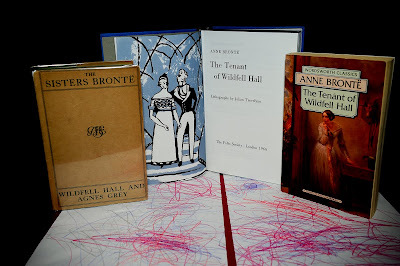 BTW, I loved Tenant of Wildfell Hall! 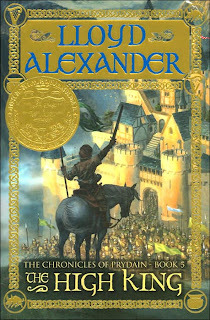 Those Lloyd Alexander books are awesome! I don't think you're out to lunch at all, Angie. I totally 'get' your obsession. It all makes perfect sense! There is security, contentment, satisfaction, and happiness from owning more than one copy. And when they have different covers it almost doesn't count are "more than one" as they are, in fact, completely different! I have multiple copies of Pride and Prejudice, Jane Eyre, Drangonlance, the Belgaraid, The Iceberg Hermit, and Emily Dickinson - off the top of my head. In the cold light of bookstore prices, I can usually control myself and not buy another copy, but used bookstores are my undoing. Why not buy another, or even two more, even with the same cover, if they are only a dollar a piece?? Library space is a problem. 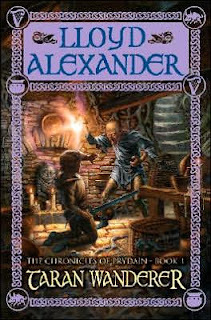 And those new Prydain chronicles are gorgeous! Lenore, that's a good excuse. I hadn't thought of the different language editions. I have a few of those as well! Raspberry, lol, I'm glad you have sooo many and it's not just me. And you collect A TALE OF TWO CITIES as well! Awesome. Seven copies of LITTLE WOMEN...that's impressive, girl. The gift giving is a whole 'nother issue, isn't it? I'm gonna have to go figure which book I've bought the most times to give away. Will report back! Steph, I know. That's the other issue. And all my books were in boxes in storage for several years. They're finally out and breathing free again. Diana, six PERSUASIONs...that makes me happy. I only have two. I love that other people have copies of loved books on hand to give away. brizmus, it's a disease. And once you start down the primrose path...hehehe. Emily, ooh, I've been wanting the most recent NINE COACHES WAITING as well. It's so lovely. And I hate that panicky feeling when you NEED to read something that's out on loan. Suey, salivation=you definitely get it. THE IVY TREE is lovely. Think you'll like it. Brenda, I hear ya. I'll often hold off for quite awhile on acquiring new ones. But I always seem to succumb in the end. Melissa, those are good choices for collections for sure. :) And I'm so happy you loved TENANT! I don't hear that very often. Made my day. I love Helen and Gilbert and the Grange. Liza, aren't they? Just great covers and about time! Julie, so I'm not crazy after all. This is good. And I can seriously buy into your it's not even the same book really mindset! It's definitely the used bookstores that'll kill ya. I just love buying old books. There's something magical about them. 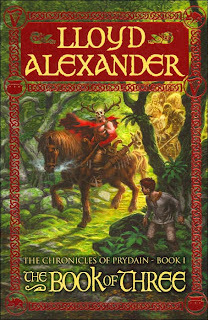 Glad you like the new Prydain covers, too. I <3 them. 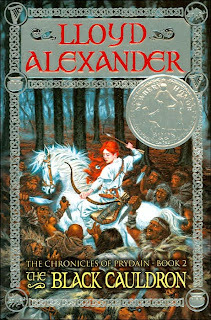 I have that edition of the Prydain books! They really have such pretty covers. I laughed when I saw the "artwork". You can always tell someone has little kids at home because of the art everywhere but on paper! The only time I have more than one copy of a book is if a new cover comes out. But I don't have people borrowing my books. If I did, I would totally understand have more copies lying around. I can see how people might want several copies of the same book, but I almost never do. I think, that's one space on my bookshelf I could be giving to a totally different book. In consequence, I spend a lot of time trying to figure out what the one perfect edition of a book is. I have doubles of Howl's Moving Castle, the Chronicles of Chrestomanci, and 3 Tamora Pierce quartets. Plus, a bunch of classics. It's mostly because my sister would temporarily misplace books, and I wouldn't know she had them and bought my own copy. And then we would find her copies. The only book I have multiple copies of is Neil Gaiman's AMERICAN GODS. Last count, five. :)One of these days, though, I think I'll own multiple copies of all of Anne Bishop's books; as it is, I have to physically restrain myself from buying the exact same copy over and again, just to have it. Them. BTW, I *love* the second cover for McKinley's OUTLAWS OF SHERWOOD. I've never seen it before, but it is a beauty. I have a few copies of Pride and Prejudice, Alice in Wonderland, and I have the UK and US editions of both The truth about forever by Sarah Dessen and Saving Francesca by Melina Marchetta. 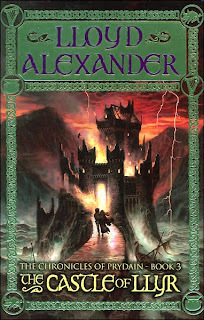 Oh and His Dark Materials. I would love a hardback copy of The Pursuit of Love and I really want to buy the UK version of Meg Cabot's Mediator series. Chachic, lucky! :) And lending copies are so important with the ones you really love. Tiah, yup. And it's the new covers that get me all the time. Jenny, ahh, a whole 'nother problem. :) Picking the one perfect edition. Very tough. choco, good reasons! I'm an only child so I never had siblings going through my books but my kids are getting up there and it will be interesting to see how they all fare. Ooh, I'm not even going to tell you how many different copies of Garth Nix's Abhorsen Trilogy I own. I also have several of The Little Prince as well. Great topic. Heather, ooh, tell me! Tell me! I love that series.